I know it has been along time since I have updated the blog but it is because I have been doing so much fishing! I took some people out yesterday for a sword fish hunt. There were seven people on the boat and 6 of them caught huge sword fishes! All of them were well over 100 lbs! I have had some followers email me asking how to hunt for these big fish and I am going to tell you the pointers to help you have a better luck when fishing for these fish. 1. They usually feed after dark. I know this is a hard one but if you have the equipment and don’t mind staying up late this is the best time to go fishing for these giants. 2. They are comfortable up to two thousand feet or more below sea level. So just know even if you can detect them you might not be able to get at them. 3. You need a concrete sinker. The weight I usually use is around 10 pounds. Since you are going thru up to 1/4 a mile of sea water you need that much to get it down there. 4. This is related to number 3. You are also going to need a lot of line (you would be surprised to see how often this one item is forgotten. 5. Make sure you have a good chair. Fighting these fish is quite a task and having a chair with a gimbal (click here if you do not know what this is) is a necessity. If you do not there is no way you are going to fight the fish from that depth and that weight with you holding on to a fishing pole and a line. 6. Help and a somebody to gaff. I cannot tell this to people enough. Not only are you pulling up a fish from deep down and weighs over 200 lbs how are you going to get that fish in the boat? 7. Even above surface they are still dangerous. If you do get your fish on to the boat be very careful. I always have people sign waivers before they go but there was this one woman that was celebrating some success that she had from getting some money for a lawsuit that she was in. She got the money from a company for some procedure that she had or something. She got this huge fish on to the boat with a couple others and the fish bucked and got her right in the leg. It was so bad that we had to call an end to the trip right there and get her to the hospital. 8. Take pictures. Because you know that nobody will believe you. 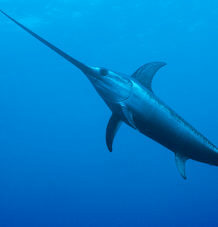 Those are my tips for all trying to make a fishing trip for sword fish. If you have any ideas or pointers that you would like me to talk about please just email us at the-clam@yahoo.com and we will ether post it on the site or we will send you an email back to help you in your fishing expedition. Till next time have fun fishing!